Although the late 1970s saw the birth of the microcomputer revolution, most people in businesses and academia still used a big mainframe computer or minicomputer (such as a DEC VAX) connected to a dumb terminal, for example the DEC VT52 or Lear-Siegler ADM3A. Early terminals were nothing more than glass teletypes – essentially replacing a box of fanfold paper with a screen. The next big advance was to make the cursor addressable, in other words to be able to place text wherever you wanted on the screen. And it was the VT52 (launched in 1975) which introduced a lot of these features to customers for the first time. 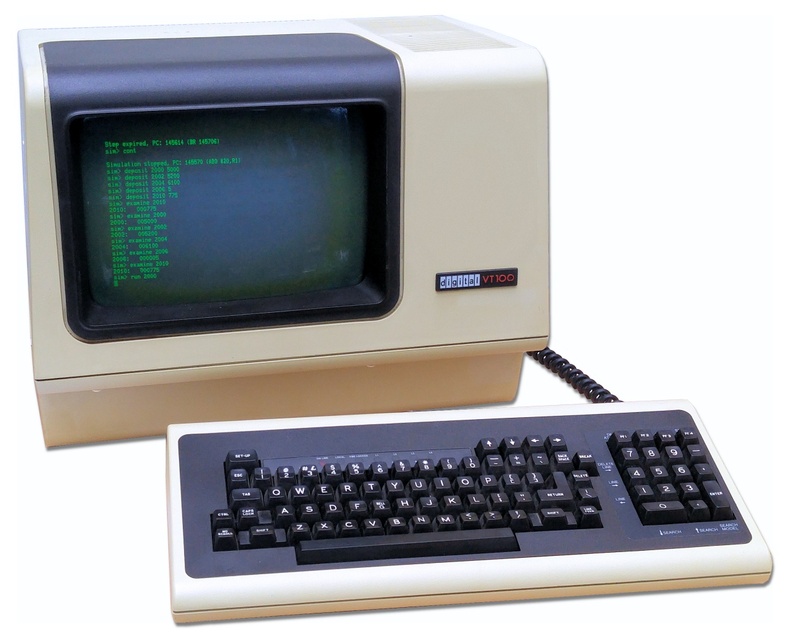 The Digital Equipment Corporation (known as DEC or just Digital for short) wanted to develop the dumb terminal further, and in August 1978 they launched the DEC VT100 which pushed the boundaries ever further with support for ANSI X3.64 codes which pretty much allowed you to do anything you liked text-wise, plus it came with some rudimentary block graphics which were very handy for designing on-screen forms. This was sophisticated stuff for the late 1970s, and the key breakthrough here was the use of an Intel 8080 (or later the 8085) microprocessor to do the hard work. Depending on variant, the 12” display could show 80 x 24 characters or up to 132 x 24 characters for a top-of-the-range version. The relatively fast 19200 baud serial interface was enough to display a full screen of 80 column text in just a second. And unlike many earlier terminals, the keyboard was attached to the main unit with a curly cable, so you could move it about to whatever position you found comfortable. As with the VT52, the VT100 came in quite a big case which could allow extra boards to be added, turning the platform into a graphics terminal (with the VT125) or even a full-blown microcomputer with the VT180. Printers could even be attached to the back of the terminal, so you could easily have your own printer rather than sharing with the rest of the office. The V100 family was a significant success at the time, and it and its successors sold six million units worldwide, until finally going out of production in 2017 with the VT520. One of the reasons that the VT terminal survived so long against more capable PCs was the low running cost – there was very little to go wrong, no moving parts and VT terminals were immune to things like computer viruses. VT terminals are still in use worldwide in locations where these things are important, such as warehouses. But perhaps more commonly these days, pretty much any terminal program emulates a VT100 by default, including the command line interface on Macs and Linux systems. Perhaps more importantly, the VT100 paved the way for modern computer applications. Connecting one to a modern computer system is a bit tricky as VT terminals primarily use a serial interface, but if you get your hands on a terminal server or media converter you might be able to make it run on Ethernet, if you are up for the challenge..